Datto, a online data backup system that integrates and backs up your Google Accounts, collected some great tips and advice from some Google Apps experts, yours truly included, for a nice article and e-book for schools looking to/already adopting Google Apps for Education. It has been so popular, that they decided to create a short Slideshare presentation of the main points. 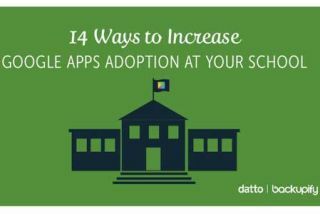 It is titled "14 Ways to Increase Google Apps Adoption at Your School" and has some great tips pulled from the ebook and summarizes them in the presentation. This is an excellent resource for any school/district that is using Google Apps.